Today's musing is brought to you by my daily morning timehop browse. I also saw this photo on Facebook memories, but the timehop app makes it easier to share these on instagram (which is where I started writing this musing - it grew so long I decided to put it here). This is also apropo because one of my Facebook friends who has a kid a few years younger than Remy asked recently when other parents introduced their kids to Harry Potter. I started to write a (very long-winded) response and realized it just got too complex to actually answer her question. And besides, while I was writing, more people chimed in with concrete answers. 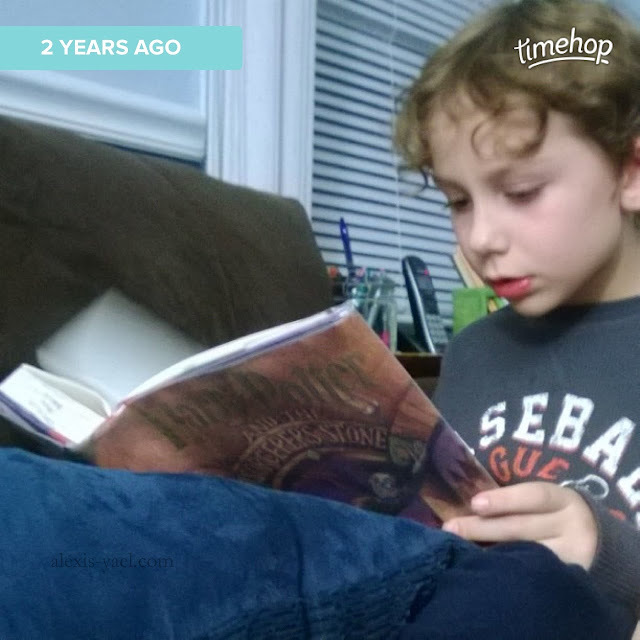 Back to the photo: as shown by the timehop banner, this photo is a throwback to two years ago, when Rem decided to start reading Harry Potter (on his own). He'd gotten into the story of Harry Potter because souster B is a fan and she introduced it to him via Lego, character encyclopedias and stories. And then one day - two years ago - we went to the library and he decided to check out the first book and start reading it, on his own. He may or may not have finished it that first time, I forget. I'm pretty sure we renewed that library book at least once, but my memory about things like that isn't the greatest. I think he started it and got deep into it and then stopped and didn't pick it up again for a few months, after B had given him the first three books in paperback for Hanukkah. I do know that eventually, over the course of a year/ year and a half (and in between a lot of other books) we read books 1-3 together (out loud before bed) and then (after rereading those multiple times on his own) he skipped ahead on his own last spring and finished the series. It took him a really long time to get through book one. And then he reread it multiple times until he was comfortable with it. (He even reread some chapters before he was ready to move on.) He didn't want to start book two for awhile, so we waited. And we stopped for a bit in the middle of book three because Harry sneaking out of Hogwarts made him so anxious (for Harry). After we downloaded book four on his kindle fire (amazon freetime unlimited, for the win!) last spring, he asked me to start reading it to him but after that first (extremely scary) part, he wanted me to stop, so I actually haven't finished it. I think he went back to read the earlier books and then read four after that, skipping the scarier parts. Then after book four he skipped ahead to read the very end of Deathly Hallows because he wanted to know it would be OK in the end. Then went back and read (parts or all of) five and six. I trust him to know what he wants to read and what will be too scary for him, within reason. Like me, sometimes things he wants to read (or see, in my case) are a little too intense. This is why he goes at his own pace. He knows his own limits, in terms of scary stuff, but he still got scared by the opening of book four because of the unexpected point of view, so he stopped. Because he went at his own pace, it was easy for him to stop (or tell me) when he needed to stop. And go back to something less scary and work his way back to the scary parts. This works for movies, too, though he is still much more cautious than I am. We bought the first Harry Potter movie last fall now (from a bargain bin somewhere) and he watched it multiple times, until he could stay in the room during the scary parts. He's still not ready for the second movie, though he says, maybe soon. And when he's ready, he knows.